Transformative changes in growing healthy and nutritious food, along with sustainable agricultural systems must be done simultaneously while protecting our planet's biodiversity. Food and Agriculture Organization (FAO) Director-General Jose Graziano da Silva mentioned this at the opening of an international dialogue on mainstreaming biodiversity into agricultural policies and practices. "The way we are producing our food is a big part of the problem…Today, the world still produces food mainly based on the principles of the Green Revolution that started more than 50 years ago and implies the use of high chemical inputs at a high cost for the environment," according to Graziano da Silva. Thus, he argued that focusing on protecting biodiversity across all sectors is "fundamental." The genetic diversity of plants can be harnessed to come up with varieties that can tolerate hotter and drier conditions. On the other hand, the loss of agricultural biodiversity poses a direct risk to food security. FAO emphasized the need for alignment of policies governing agricultural sectors, the use of natural resources, protection and conservation of endangered species, habitats, and biodiversity to add more protection to the environment and lessen the ecological footprint of agriculture, forestry, and fisheries. Read more from the media release of FAO. African countries governments must take the lead both in designing and funding climate smart agricultural (CSA) practices. This is according to an article written by Dr. Esther Ngumbi, a researcher from The Aspen Institute in the U.S. Early this year, the World Bank launched one of its largest climate smart agriculture initiatives to support over 25 million smallholder farmers in Maharashtra, India. The project is expected to lead to the sustainable development of agricultural productivity, water scarcity, soil health, and improve farmer resilience in adapting to climate change. Climate change continues to affect many countries around the world as manifested by recurrent droughts, prolonged dry seasons, floods, increased crop pest infestations, and emergence of new problems such as the fall armyworm in Africa. The smallholder farmers are the most affected by these problems, and many of them depend on agriculture as their primary source of income. This shows that more CSA initiatives need to be rolled out and supported in many of the climate change impacted countries including countries in the African continent. Dr. Ngumbi highlights that African governments need to identify the suitable and appropriate CSA practices adapted for their countries and come up with further plans on how these practices will be rolled out across their respective countries. Dr. Ngumbi also recommends that the CSA initiative must be inclusive, wherein African farmers and other beneficiaries should be consulted and involved in defining and choosing the appropriate CSA practices. Demonstration centers or on the ground model farms must also be established so that farmers can learn and see the actual CSA practices. Read the article in All Africa. An international team of researchers from Harvard University in the United States and Sogang University in Seoul, Korea has engineered a cell-like structure that harnesses photosynthesis to perform metabolic reactions, including energy harvesting, carbon fixation, and cytoskeleton formation. The researchers engineered a photosynthetic organelle from the unique components from plants and animals to build the synthetic system. Keel Yong Lee, a postdoctoral fellow at the Harvard John A. Paulson School of Engineering and Applied Sciences (SEAS) said that their idea is simple. They chose two protein photoconverters, one from plants, the other from bacteria, which can generate a gradient across the cellular membrane to trigger reactions. The photoconverters are sensitive to red and green wavelengths of light. The proteins were embedded in a simple lipid membrane, along with enzymes that generate adenosine triphosphate (ATP), the essential energy of cells. When the membrane is illuminated with red light, a photosynthetic chemical reaction occurs, producing ATP. When the membrane is illuminated with green light, the production stops. The ability to turn energy production on and off allows the researchers to control many reactions within the cell. For more details, read the news article at SEAS. On May 24, 2018, the United States Food and Drug Administration (US FDA) released a statement on GR2E Golden Rice, a rice genetically engineered to produce provitamin A carotenoids. The US FDA statement concurs with the assessment of the International Rice Research Institute (IRRI) regarding the safety and nutrition of Golden Rice. The US FDA approval is the third positive food safety evaluation of Golden Rice, after the approvals granted by Food Standards Australia New Zealand (FSANZ) and Health Canada in February and March 2018, respectively. "Each regulatory application that Golden Rice completes with national regulatory agencies takes us one step closer to bringing Golden Rice to the people who need it the most," says IRRI Director General Matthew Morell. 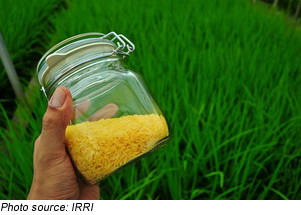 He added that the rigorous safety standards observed by the US FDA and other agencies provide a model for decision-making in all countries wishing to reap the benefits of Golden Rice. For more details, read the IRRI media release. More than 60 people composed largely of legislators, legislative staff, and students "feasted on facts" as the film's tagline puts it, during the special screening of the documentary, Food Evolution, held on May 23 at the Philippine House of Representatives. The film was shown as part of the Biotechnology Exhibit themed Bioteknolohiya: Pambansang Hamon, Pambansang Solusyon (Biotechnology: Our Nation's Challenge, Our Nation's Solution) organized by the Department of Agriculture's Biotechnology Program Office from May 21-24, 2018. The film looked into the controversy surrounding genetically modified organisms (GMOs) and food, and showed how misinformation, confusion, and fear can muddle with science and influence public perception. Enlisting experts as well as farmers and scientists worldwide, the film aimed to separate myths from facts and open avenues for discussion to help audiences reach their own conclusions on the issue. Dr. Rhodora R. Aldemita, Director of ISAAA Global Knowledge Center on Crop Biotechnology, addressed questions from the audience during the open forum. The film got the attention of several legislators, including Rep. Manuel Sagarbarria who suggested screening it to a wider audience, especially in the provinces. Meanwhile, Rep. Evelina Escudero inquired if there are existing studies on the long-term effects of GM crops on humans to which Dr. Aldemita responded that GM food undergoes a series of rigorous studies and food safety assessments before it is released for public consumption. She further emphasized that scientists continuously study this area and are on the lookout for new developments. It also garnered positive feedback from audience members with majority recommending that a similar screening be held to disseminate valid information regarding biotechnology and GM in particular. Most of them found the film appealing as it presented both sides of the debate and laymanized the highly technical terms. Others even wanted to see a similar documentary based on Asian and Philippine setting as well as discussions on the concept of co-existence between organic farming and biotechnology. The special screening was conducted in coordination with ISAAA and the Southeast Asian Regional Center for Graduate Study and Research in Agriculture-Biotechnology Information Center (SEARCA-BIC). For more information on biotechnology in the Philippines, visit the SEARCA BIC website. The Panel on Genetically Modified Organisms of the European Food Safety Authority (EFSA) (GMO Panel) has published the Scientific Opinion on the safety of genetically modified (GM) maize (Zea mays L.) 4114 (Unique Identifier DP‐ØØ4114‐3). The scientific opinion is published based on the application EFSA‐GMO‐NL‐2014‐123 under Regulation (EC) No. 1829/2003 from Pioneer Overseas Corporation. The scope of the application EFSA‐GMO‐NL‐2014‐123 is for import, processing, and food and feed uses of maize 4114 within the European Union (EU), but excludes cultivation in the EU. The GMO Panel did not identify any safety issues pertaining to the intended uses of maize 4114 and concludes that maize 4114, as described in the application, is as safe as its non‐GM comparator(s) and the tested non‐GM reference varieties with respect to potential effects on human and animal health and the environment. For more details, read the scientific opinion in the EFSA Journal. Mustard aphid (Lipaphis erysimi) is the most devastating sucking insect pest of Indian mustard (Brassica juncea L.). The taro (Colocasia esculenta) tuber agglutinin (CEA), has previously been reported to be effective against a wide array of hemipteran insects in artificial diet-based bioassays. Ayan Das together with colleagues from the Bose Institute in India conducted a study to develop transgenic Indian mustard expressing CEA from taro. Analysis of the transgenic plants confirmed stable integration of cea gene. Expression of CEA in transgenic plants was also confirmed. In the in planta insect bioassays, the CEA expressing Indian mustard lines exhibited significant enhanced insect mortality. The fecundity of the mustard aphid pest was also reduced compared to that in control plants. Biosafety assessment of the transgenic B. juncea protein containing CEA was also carried out. The results demonstrated that the expressed CEA protein from transgenic Indian mustard does not incite any allergenic response. This study establishes CEA as an efficient insecticidal and non-allergenic protein to be utilized for controlling mustard aphid and similar hemipteran insects. For more information, read the article in Plant Cell Reports. GM crops go through multi-location field trials to analyze the agronomics, composition, and the concentration of transgenic proteins, which is a main consideration in safety assessment of GM crops. Reference proteins are expected to maintain a relatively stable expression pattern in healthy plants given their function in various cellular functions. Understanding the effects of genotype, growth stage, and location on reference proteins may provide insight into the contribution these factors could have on transgenic protein concentrations in GM crops. Thus, scientists from India, USA, and Thailand studied the concentrations of three endogenous proteins (actin, elongation factor 1-alpha, and glyceraldehyde 3-phosphate dehydrogenase) in several different maize hybrids grown across multiple field locations over two years. The researchers collected leaf samples from healthy plants from different developmental stages across the growing seasons. Results of the enzyme-linked immunosorbent assay (ELISA) showed that the concentrations of the three proteins were relatively consistent across hybrid backgrounds, when compared within one growth stage and location (2–26%CV), whereas the concentrations of proteins in the same hybrid and growth stage across different locations were more variable (12–64%CV). In general, the protein concentrations in the two years of study showed similar trends in variability. According to the researchers, some degree of variability in protein concentrations was expected for both transgenic and endogenous plant-expressed proteins. In the case of GM crops, the potential variation in protein concentrations due to location effects is captured in the current model of multi-location field testing. The calcineurin B-like protein (CBL)-interacting protein kinase (CIPK) signaling pathway responds to various abiotic stresses in plants. The research team of Xiao-Yu Cui and Yong-Tao Du from the Chinese Academy of Agricultural Sciences studied the CIPK23 gene from wheat (Triticum aestivum). The wheat CIPK23 was found to be induced by multiple abiotic stresses including drought, salt, and abscisic acid (ABA). The TaCIPK23-overexpression wheat and Arabidopsis lines showed higher survival rates under drought conditions as well as enhanced germination rates, developed root system, and reduced water loss rate. Analysis revealed that overexpression of TaCIPK23 made transgenic plants ABA sensitive, as evidenced by the delayed seed germination and the induction of stomatal closure. Consistent with the ABA-sensitive phenotype, the expression level of drought- and ABA-responsive genes were also increased under drought conditions in the transgenic plants. These results suggest that TaCIPK23 plays vital roles in ABA and drought stress responses in wheat. For more information, read the article in BMC Plant Biology. In China, a low planting density and a short canopy made field watermelon (Citrullus lanatus) severely threatened by weeds. Currently, only five herbicides are registered for watermelon weed control in China, most of which provide minimal control on broad-leaved weeds. Hence, alternative solutions for weed control are needed by watermelon growers. In this research, the team of Shouwei Tian from the Beijing Academy of Agriculture and Forestry Sciences led a team of scientists to edit the watermelon acetolactate synthase (ALS) gene in hopes of conferring herbicide resistance. A designed sgRNA was transformed into the cotyledon of watermelon ZG94, an elite inbred variety used for the production of edible seeds and as a parent line to commercial hybrid seeds. Analysis revealed that 45 out of 199 transgenic plants had the desired mutations, indicating an efficiency of 23% at T0 generation. These mutations were also proven to be transmitted to succeeding generations. The resulting genome-edited plants were found to be tolerant to sulfonylurea-based herbicides. This study proves that the CRISPR-Cas9 system is a powerful tool for improvement of watermelon varieties. Plant resistance genes usually encode proteins with nucleotide binding site-leucine rich repeat (NLR) domains. However, the team of Haijun Zhao from the USDA ARS Dale Bumpers National Rice Research Center in USA studied the Ptr gene from rice (Oryza sativa), which encodes a different protein compared to a typical resistance gene, and hypothesizes that it may also be a resistance gene in rice. Ptr was found to be required for broad-spectrum blast resistance mediated by the NLR R gene, Pi-ta, and by the associated R gene, Pi-ta2. Ptr was also found to be s expressed constitutively and is localized in the cytoplasm. A two base pair deletion within the Ptr coding region in the mutant line M2354 resulted in susceptibility to rice blast caused by Magnaporthe oryzae. Targeted mutation of Ptr in a resistant cultivar using the CRISPR-Cas9 system led to blast susceptibility, further confirming its resistance function. The study suggests that Ptr is involved in blast resistance and can be a candidate gene for the development of broad spectrum blast resistant rice. For more information, read the article in Nature Communications. While experimental evidence demonstrates that histone methylations play roles in plant growth and development of Arabidopsis, not much is known regarding their function in rapeseed (Brassica napus). The team of Ling Jiang from Hunan Agricultural University in China characterized two genes encoding homologs of the Arabidopsis histone 3 lysine 36 (H3K36) methyltransferase SDG8, namely, BnaSDG8.A and BnaSDG8.C. To investigate their function, BnaSDG8.A and C were expressed individually in an SDG8-deficient, early-flowering, Arabidopsis mutant. Expression of either of the two genes was found capable of rescuing the mutant line. Using RNAi and CRISPR-Cas9, the team then developed BnaSDG8.A and C knockdown and knockout mutants, respectively, to further prove their functions. The developed lines both exhibited early flowering phenotype compared to the control plants. Further analysis of the mutants revealed that BnaSDG8.A and C prevent the floral transition of rapeseed by repressing the flowering gene, BnaFLC. These results on the floral transition in rapeseed could provide useful information for the development of breeding early‐flowering varieties. For more information, read the article in The Plant Journal. Carotenoids are plant secondary metabolites that are important in the diet of higher animals due to their functions in important physiological processes. 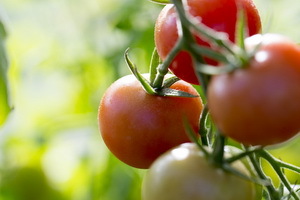 The team of Caterina D'Ambrosio from Agenzia Lucana per lo Sviluppo e l'Innovazione in Agricoltura in Italy tested the efficacy of CRISPR-Cas9 in tomato by targeting two key genes of carotenoid biosynthesis, Psy1 and CrtR-b2. Psy1 and CrtR-b2 were chosen as targets for CRISPR since their knockout is easily detectable. Two CRISPR-Cas9 constructs were designed to target each gene. Thirty-four out of forty-nine (69%) transformed plants showed the loss-of-function phenotypes due to the editing of both loci. However, by including plants edited only in either of the two loci, the genome-editing rate reached 84%. These results prove that the CRISPR-Cas9 system can be an efficient and quick method for generating useful mutations in tomato for use in breeding programs. For more information, read the article in Transgenic Research. Climate change has been predicted to decrease the area suitable for growing coffee by as much as 50 percent by 2050. Researchers at the University of California Davis (UC Davis) have taken a major step that could lead to the development of new disease-resistant varieties adaptable to climate change. In 2017, UC Davis geneticists released the genome sequence of Coffea arabica for the first time. Coffea arabica is a species responsible for 70 percent of global coffee production. Now, a new genome sequence is available and posted to Phytozome.net, the public database for comparative plant genomics coordinated by the U.S. Department of Energy's Joint Genome Institute. It is available for use by scientists and plant breeders around the world. Juan Medrano, a geneticist in the UC Davis College of Agricultural and Environmental Sciences and co-researcher on the sequencing effort, said the new genome sequence contains information crucial for developing high-quality, disease-resistant coffee varieties that can adapt to the climate changes that are expected to threaten global coffee production in the next 30 years. The release of the new sequence is also meaningful to California, where coffee plants are being grown commercially for the first time in the continental United States, and a specialty-coffee industry is emerging. For more information, read the UC Davis news article. 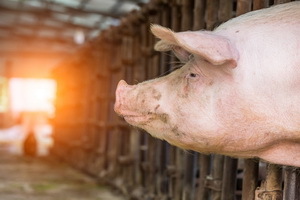 A new research published in eLife presents transgenic pigs with the ability to digest more nutrients, which could possibly help reduce the pork industry's environmental impact. A large amount of feed for pigs is wasted as they are unable to digest two of its key nutrients that cause environmental damage: nitrogen and phosphorus. Excessive amounts of these nutrients are subsequently released through the animals' manure into the environment, where they can pollute both air and water. Pigs release harmful amounts of these nutrients as they lack the microbial enzymes that break down phytate - the main source of nitrogen and phosphorus - and types of fiber called non-starch polysaccharides. The enzymes are β-glucanase, xylanase, and phytase. The group led by Xianwei Zhang, postdoctoral researcher at the South China Agricultural University delivered the three enzymes into the genome of pigs. The enzymes were optimized to adapt to the pigs' digestive system. They were expressed specifically in the pigs' salivary gland, allowing the digestion of phytate and non-starch polysaccharides to begin in the mouth. The feeding trials showed that the pigs were able to digest these and other key nutrients, lowering their emissions as a result. The team also found that the animals' increased nutrient uptake led to a faster growth rate, and that no negative side effected were reported. For more details, read the paper in eLife. Four world-renowned climate change scientists and policy experts will speak during this event: Dr. Michael Mann, Dr. David W. Titley, Dr. Patrick Moore, and Dr. Judith Curry. Topics to be discussed include the causes and effects of climate change, prognosis for the future, and what can and should be done to prepare for those changes. For more details, visit the forum website. For more details, read the annoucement at Help Biotech. The Cornell Alliance for Science released a video documenting the story of GM potato development in Uganda. It shows how farmers in Uganda frequently apply fungicides to protect their potato crops from the devastating late blight disease (LBD), which can ruin the entire harvest. Ugandan scientists have used the tools of genetic engineering to make a popular potato variety, the Victoria, resistant to LBD — reducing the need for fungicides. But Uganda's politicians must approve the nation's long-awaited biosafety bill before small-holder farmers can benefit from this innovative new crop. Watch the video from Cornell Alliance for Science.